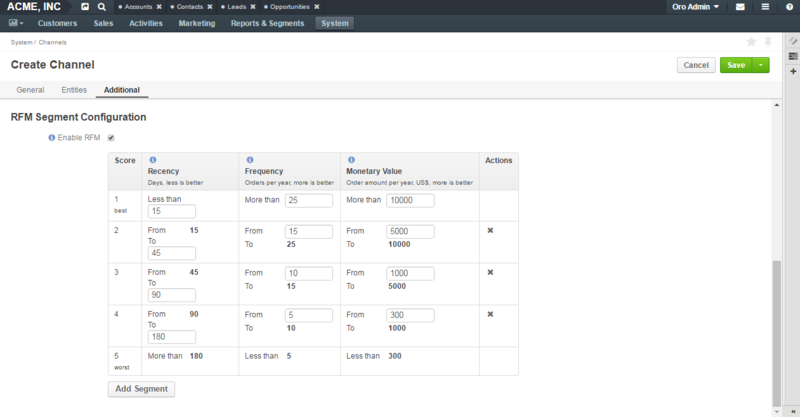 In OroCRM the RFM metrics are available for Magento customers and are defined per channel. For information about what is RFM and how to use it in OroCRM, please see the RFM Analysis guide. Start creating a new Magento channel. To do this, follow the instructions provided in the Create a Channel Record section of the Channels guide. For Channel Type, select Magento. In the RFM Segment Configuration section, select the Enable RFM check box. The default ranking table appears. If required, modify the ranking table as described in the Modify the Ranking Table section of this guide. Click the Save button at the upper right-hand corner. Recency shows the number of days since the last order made by a customer. Measured in days. The fewer days has passed, the better must be the score. Monetary value shows the total amount of money spent during the last 365 days. The more is spent, the better must be the score. Score 1 is considered the best. You need to specify only one of the thresholds, the other is filled in automatically. For information about how to define segments, see the How the RFM Analysis Is Done section of the RFM Analysis guide. If required, add another segment. To do this, click the Add Segment button under the table. Repeat until all the categories added. You can add as many segments as you want. If required, delete excess segments. To do this, click the X icon in the Actions column at the end of the segment row. You cannot delete segments if there are only two segments left. In the Main Menu, point to System and in the drop-down menu, click Channels. On the channel view, click the Edit button at the upper right-hand corner. Follow steps 2–5 of the Configure RFM While Creating a New Channel section. On the channel view, click Additional Information and in the RFM Segment Configuration section, review the RFM settings. In the RFM Segment Configuration section, clear the Enable RFM check box.